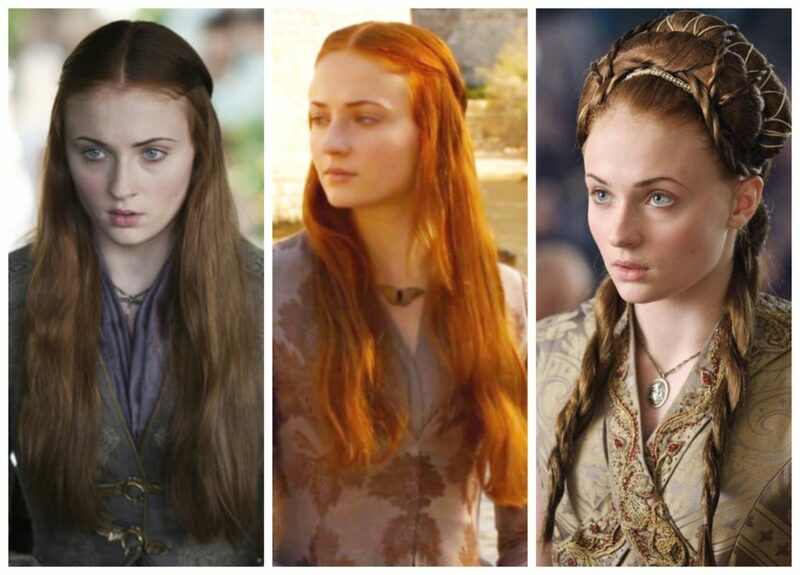 If you’re as big a GOT fanatic as I am, you’ll know that Sansa Stark, played by Sophie Turner, is not only one of the strongest characters in the show, but also goes through some of the biggest transformations of any character. She starts out as a naive, delicate, and quite romantic young girl, and transforms into a strong woman who is a force to be reckoned with. Her style grows less and less fanciful, feminine, and delicate as she grows less immature about the ways of the world and how manipulative and cruel the people in it can be. She begins the show with delicate insects (butterflies and dragonflies) and turns to more buckles and chains which portrays her strength, and given what she’s been through, can you blame her? 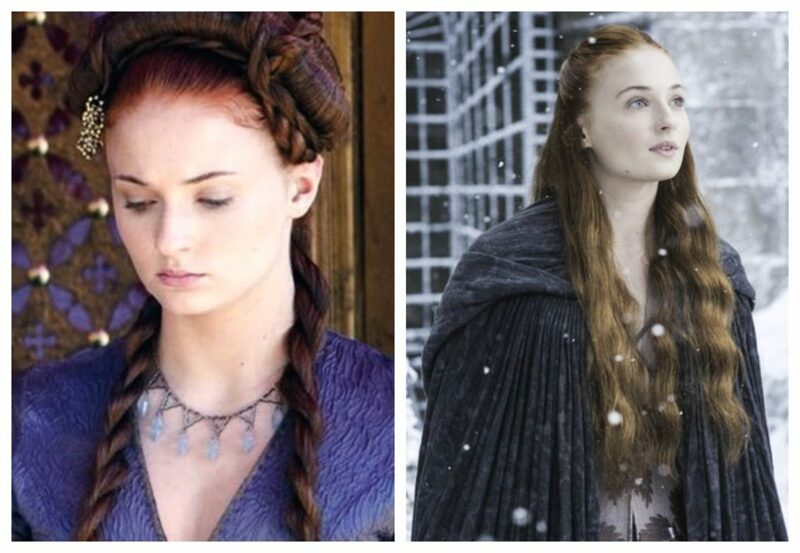 Let’s take a look at her necklaces, rings, and embroidery throughout the seasons. 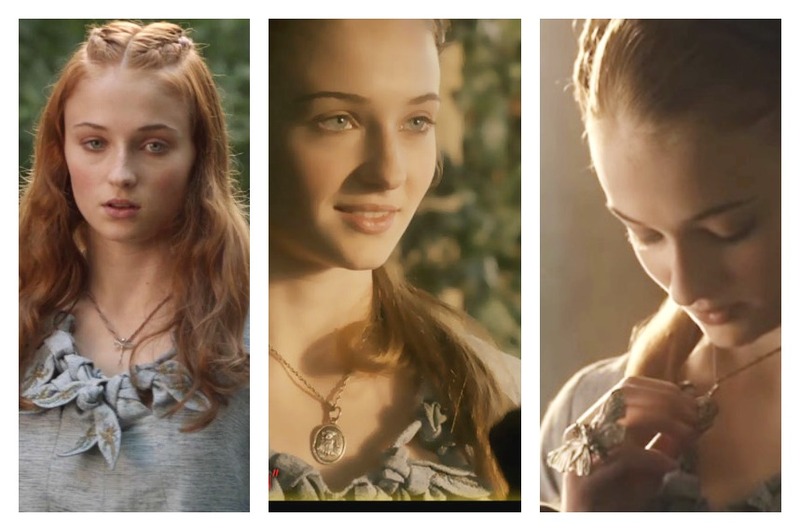 Sansa in Season 1 wears a delicate dragonfly necklace and large butterfly ring. These fragile creatures mirror her own innocence in the first season of Game of Thrones. The sweet winged insects Sansa enjoys wearing seems to mimic her desire to fly away, first from her home in the north at Winterfell and later to fly away from King’s Landing to Highgarden. She is also given a Lannister sigil necklace (the lion) by Joffrey Baratheon, just like the one his mother, Queen Cersei, wears. Sansa takes this as a sign of his affections, but as we learn all too soon, Joffrey is more likely to pluck the wings off butterflies than treat them with love and care. Sansa quickly becomes less hopeful and soon stops romanticizing about her beloved Joffrey and her new home in King’s Landing. She’s now basically a prisoner within the walls of the castle, with her father having been convicted and executed as a traitor. She continues to wear feminine clothes and jewelry, playing the part of the dutiful fiancee to the King. After the Battle of the Blackwater and Joffrey’s new betrothal to Margaery Tyrell, she has a very short lived moment of happiness at being freed from Joffrey. In Season 3, Sansa and Margaery become friends, and Sansa soon finds a bit of hope again in the prospect of marrying the Loras Tyrell, The Knight of Flowers. Those hopes are quickly dashed as Tywin Lannister, Joffrey’s grandfather and Hand of the King weds her to Tyrion Lannister, Joffrey’s uncle. 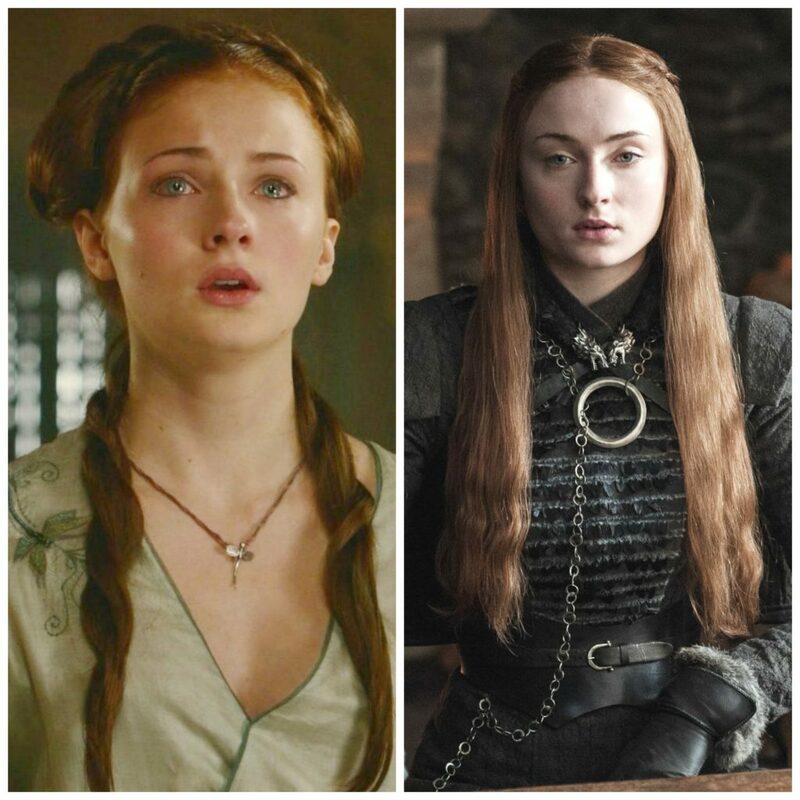 Sansa’s hope for freedom continues to be mirrored by her winged jewelry, but is quickly replaced by the Lannister Lion pendant when she weds Lord Tyrion. In Season 4, Sansa continues to show she’s a survivor, if still a bit naive about trusting people. 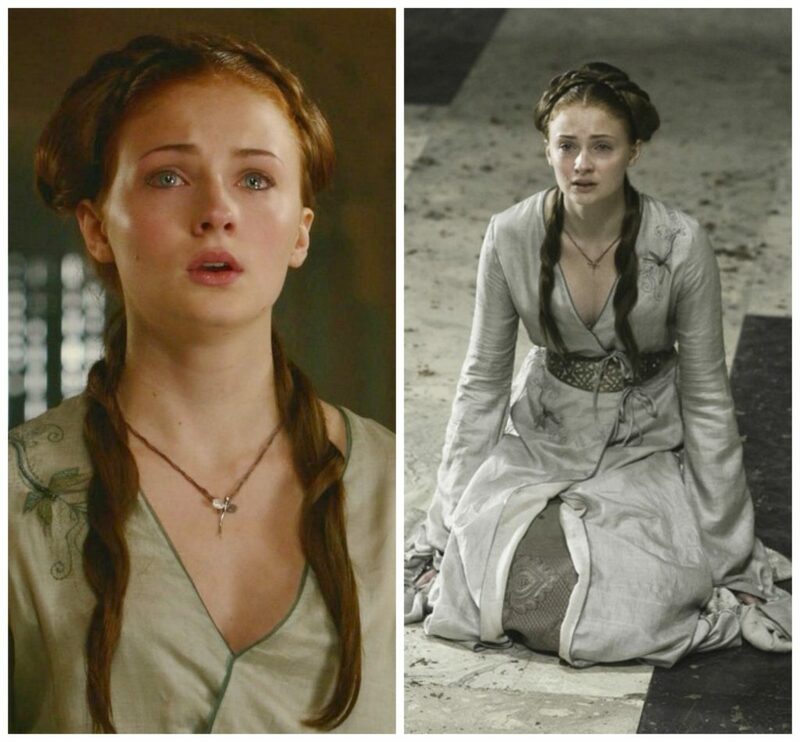 At Joffrey’s wedding to Margaery, she wears a necklace planted on her that conceals the poison which will kill Joffrey. As elegant as the necklace is, this is a turning point in Sansa’s hopeful, feminine jewelry taste. Sansa is whisked off to The Eyrie by Petyr Baelish where she is once again used as a pawn in The Game of Thrones. In Season 5, Sansa is betrothed and married off again, but this time to Ramsay Bolton. 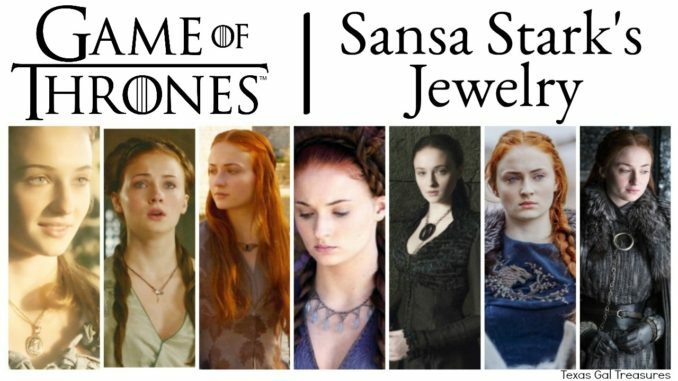 Her jewelry becomes a lot less delicate, as does she in this season of Game of Thrones. In Season 6, Sansa becomes a much more shrewd woman and doesn’t follow anyone else’s lead. 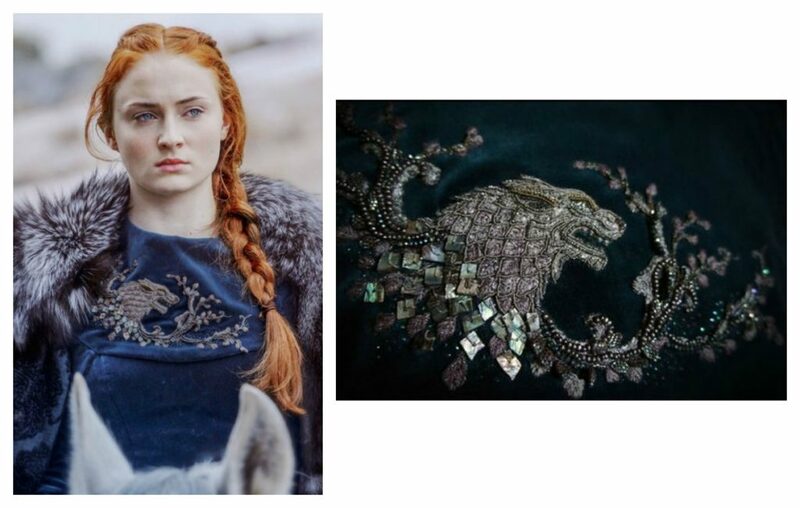 She’s done being taken advantage of and begins to proudly wear the direwolf sigil of House Stark, as seen embroidered across her dress above. 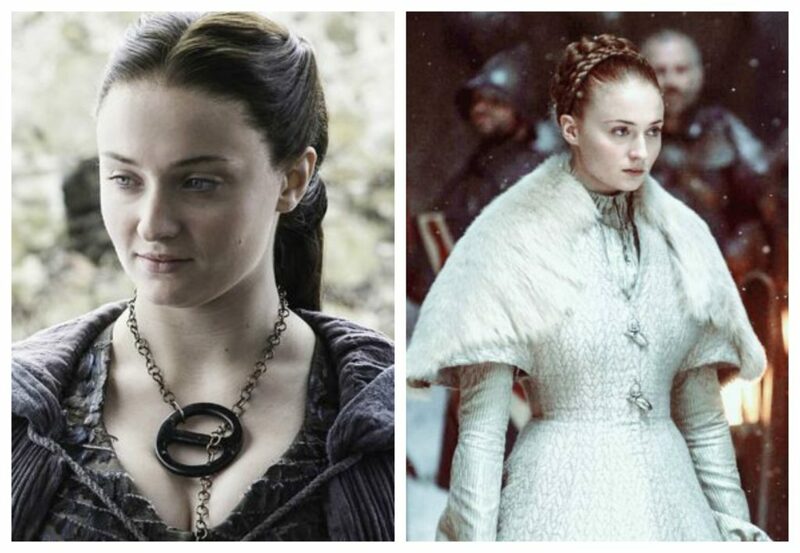 Sansa in Season 7 and (so far) in Season 8 wears a similar ring and needle necklace as from previous seasons, with a few changes. The ring is now silver metal without a bar dissecting the center. She also wears dire wolf collar clips/brooch at her throat. She is far from the naive girl that left Winterfell for King’s Landing some 10 years earlier, and some might say is a real contender to sit on the Iron Throne once The Game of Thrones is decided in Season 8.